Empowered disabled can be creative and productive citizens of our society. Our endeavor is to bring together various resources to make this happen. In a positive and right kind of setup disabled are able to make use of their special gifts. We run several ongoing projects and also train and enable several other agencies and institutions involved with disabled. Aids & Appliances - Provision of aids & appliances is the first step towards the rehabilitation of persons with disability. Mobility aids like crutches, artificial limbs when chairs are the basics for physically challenged persons while hearing aids and speech trainers are for the hearing impaired and walking sticks, tape recorders and braille books are for the visually impaired. Early Intervention - Early intervention and stimulation of the child with disability is based on the inputs from the Research & Diagnostic center of the Spastics Society of Karnataka. Early intervention prevents further disabling of the child due to a non-conducive environment and helps in overcoming the delay in achieving the mile-stones of development. Respite Care - This is a special care facility for children with severe multiple disorders and who can not be placed in the educational or vocational streams. Parents of older children from this facility may form self help groups to pool their resources and offer respite care to their wards. We may help in initiating and supporting such processes. Vocational Training - To enable the child in basic and advanced pre-vocational skills like cutting, pasting, threading, punching, cooking and catering which will enable the child to progress towards and economically rewarding activity. Counseling & Meetings - Counseling of new parents and disabled adults regarding the nature and intensity of the impairments, the opportunities available to them in the community, forming support groups for lobbying and advocacy are all part of the futuristic vision of Heart & Soul Foundation. Parent meetings, staff meetings, volunteer meetings and donor meets are planned carefully with specific objectives. Recreation - Music, dance, drama are exercises in therapy and entertainment for children and adults with special needs. Enough time and resources are spent to bring out the artistic and sports talents of persons with disabilities. Update Seminars & Workshops - Our staff, volunteers and parents of our special children undergo continuous training through update seminars and workshops on rehabilitation, therapies and art forms for special children. 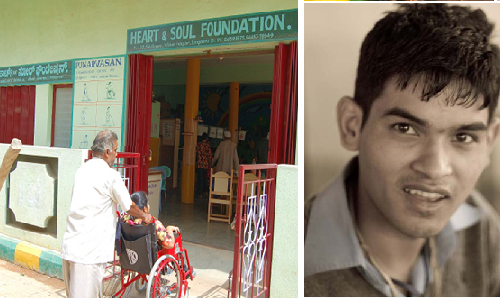 Punarvasan - Started in 2004, a free community based rehab center in a technical partnership with Spastics Society of Karnataka with about 30 children. The younger ones are in a non-formal education group while the older ones are in vocational training group. Functional academics, vocational training, recreational skills and physio-occupational services are provided in one-hall setting within the slum community itself. Guru Arpan - In Sep 2007, a training program was offered to establish a rehab center in Chintamani village that now caters to about 30 children and adults with varying challenges. In 2009, a new center was opened in Salem, which has about 8 children currently.